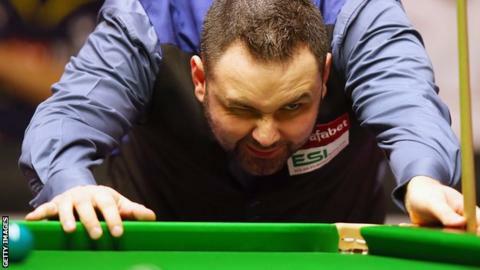 Stephen Maguire says next opponent Mark Davis is "probably playing the best snooker of his career"
Stephen Maguire said the tables at the UK Championship were "not good enough for a big tournament" after beating Jamie Cope 6-0 in the second round. Scot Maguire, who meets Mark Davis in round three, told BBC Sport the table he faced Cope on was "one of the worst I've played on". "It's not good for the crowd because we can't play good snooker," he added. World number nine Ding Junhui has also criticised the playing conditions in York, saying they were "for amateurs". World Snooker says it is aware of the players' concerns and is looking into ways to address the situation. Maguire, ranked 15, said he had "no confidence" where the ball would go after bouncing off a cushion. He also criticised the planned rule changes for toilet breaks. For February's German Masters, players will be limited to two breaks for best-of-seven ties, and three for best-of-nine, in order to speed matches up. Maguire said: "Most of the boys out there, if they go to the toilet they're back before the referee has set up the balls. You're not slowing the game down. "Some boys need to go, some boys have weak bladders. You're out there drinking water. The toilet breaks are harsh. If I'm out there and I need to go, I'm going." Maguire made short work of Cope, but knows it will be a tougher proposition against world number 20 Davis. Both players are vying for a spot at the Masters, for which the top 16 qualify. "He's probably playing the best snooker of his career," he said. "It's a big match between us because of the Masters situation."